Gameweek 24 brought with it some shock results, with just 2 of the top 6 sides managing to come out of it with wins to their name. 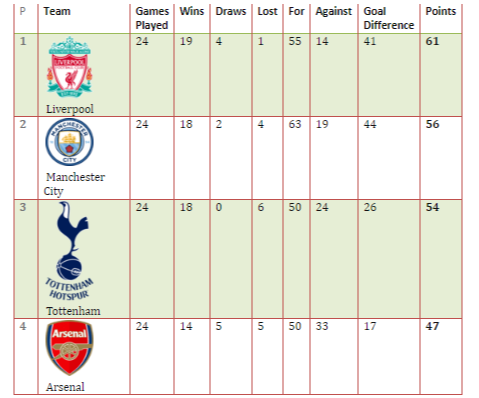 In what was a topsy-turvy set of fixtures in the premier league, Manchester City and Chelsea both slumped to unexpected defeats while Liverpool and Arsenal were able to edge past with only draws, meaning Tottenham made up heavy ground after managing to see off Fulham with an injury-time winner to consolidate their third spot in the table. We begin our wrap up of the Premier league gameweek 24 results with the biggest talking point in Chelsea’s aberration at the hands of Bournemouth. Wiping away semblance from what was a good first 45 minutes for the tourists, Bournemouth made the most of Chelsea’s lack of incisiveness and decisiveness in front of the goal, hitting 4 past them in the second half as they counter-attacked with speed and precision, building up some extremely well-crafted moves to demolish Chelsea and send them packing out of the top 4 for the first time this season. Chelsea’s agonising result was all their own making, with no one but them responsible for the underwhelming and tentative performance, put income the second half. 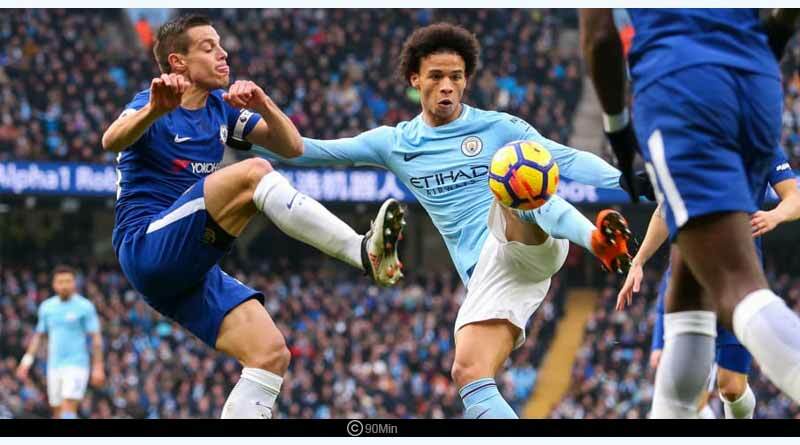 Conceding early into the second half of the game, Chelsea was flummoxed, with the defence falling apart shambolically to incur one of their heaviest defeats in recent times. From their perspective, it was not just the defeat but the manner it came about that has tarnished the club’s efforts to see themselves in the top 4 of the table. 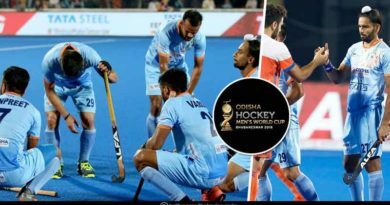 There were massive defensive lapses, while at the front the same script was played out with the attacking unit failing to work in cohesion and string together the final moves needed to open the scoring, unsavoury and maligned in nature, the result has sparked massive outrage among supporters and it’s clear that this is a problem much larger than just the style of play the side is trying to dole out. 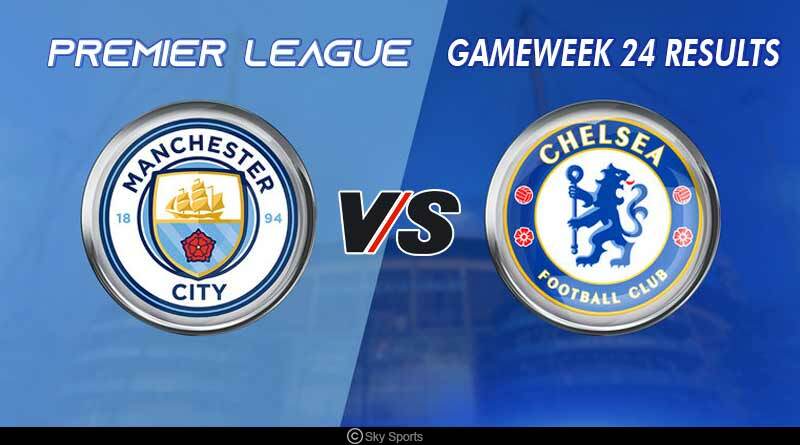 The players lack the determination, grit and gusty nature needed to come back in matches, a problem that fails to see anyone take the accountability on themselves and needs to be addressed if Chelsea is to finish significantly high in the standings. The other result which left everyone stunned was Manchester City failing to get even a point against Newcastle United. With Aguero putting them in front after just 24 minutes, the quickest goal to be scored this season, all signs pointed towards a massive City win but complacency seeped in through their game, seeing them put out of their most lacklustre displays all season. They went onto eventually losing 2-1, giving Liverpool a massive opportunity to move 7 points clear the next day. Leader Liverpool was able to make the most of the incentive offered to them, failing to seize the rare opportunity of a City defeat as they ended up sharing the spoils against Leicester City at home. Playing under severe conditions on a pitch laden with snow, the inclement weather and a lack of a proper attacking threat in front of goal saw Liverpool fail to score in the second half after their lead had been wiped off just before the first came to an end. 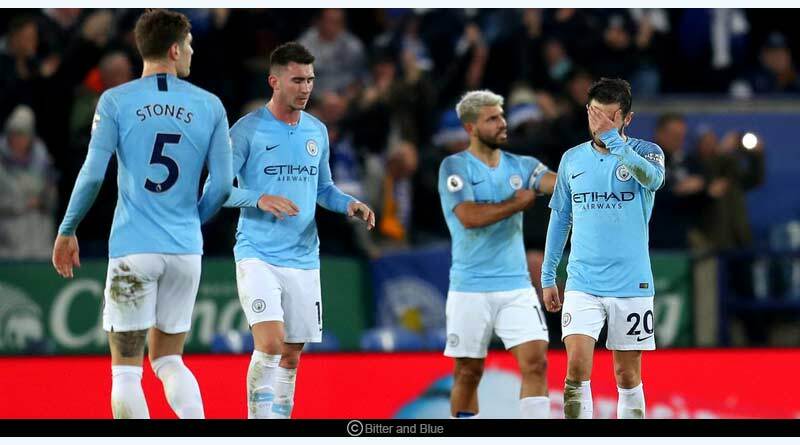 The result put them 5 points in front of City but the overall feeling as one left the stadium was of a heavy defeat, knowing it was two points dropped rather than one gained. Meanwhile, at the bottom of the table, the misery continued to pile up for Huddersfield, Fulham and Cardiff, who all lost their respective matches and are finding it tougher than ever to overturn their predicament. 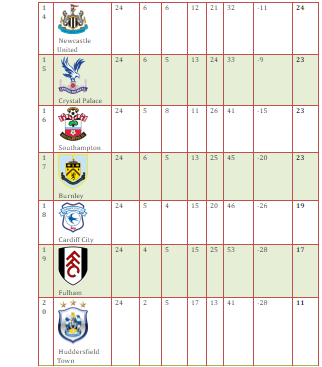 Worst placed of all are Huddersfield, who with just 11 points see a stark contrast between themselves and everyone else and look certain to be set for the drop come the end of the season.